I already noticed several times that I am often the only one in opens carrying his portable. Some people even give me strange looks and wonder what I want to accomplish as there is anyway not enough time to prepare between the rounds. At maximum some players will consult their smartphones to get a quick glance at the most recent games of their next opponent. I guess my backpack also generated some curiosity at the board-members of lsv chesspirant as end of last year I was invited to give last Saturday an extensive lecture about chess-software. It is a theme which I care about so I accepted the challenge. Almost 4 hours I kept on talking about all kind of different applications so the attendees were afterwards really exhausted and eager to get their refreshments offered in the format of a New Year-reception. Impressive was the first reaction I got so I immediately understood things didn't go very smoothly. The lecture lasted too long and probably I should have made things much lighter. The next day in my weekly chess-course in Mechelen I also talked about chess-software but I avoided the same mistakes. This time I first checked carefully which tools my students use and know today already. Not much I concluded. 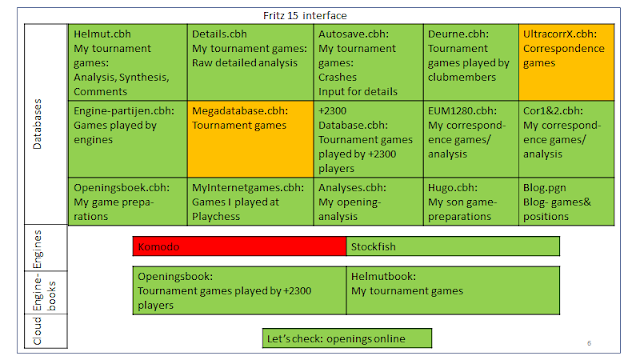 I recommended them to start using the Fritz-interface as I already did before in my article using databases. That one program is a sort of cockpit or control-room in which you can operate the different applications very rapidly. Below you can find a schematic drawing of all the components controlled by the Fritz-interface on my computer. I use version 15 which you get for free if you buy Komodo 11 (80 euro). You can also get the same interface by buying Houdini 6 of the Belg Robert Houdart which won last year TCEC season 10 superfinal but it is slightly more expensive (100 euro). After all end of last year verson 16 of the interface was launched. However the new features (e.g. spelling-check and voice-recognition) are for me not important and besides you can get for now the interface only by buying the 200 points weaker Fritz-engine. Next it is important to know very well all basic features of the interface. I really underestimated that in my lecture at LSV. I assumed advanced players know how to create an engine-book and how to interpret the output of an engine but I was wrong. Also my students in Mechelen never read any manual of a Chessbase-program. Anyway this is not something specific for chess. People read generally no manuals see eg. the recent hln article in which is stated that 75% of the drivers doesn't know the meaning of the many warning-lights of their dashboard. I am not claiming to read every manual or every list of terms and conditions when I buy or subscribe to something as that would take maybe half of my free time. Still some things like a manual of a car one should really read for its own safety. I bought last year a new car after my 15+ year old car broke down so I spent several hours reading the manual of that new car. I also understood many years ago that it is absolutely necessary to read the online Fritz-manual if you want to prepare and analyze optimally. Anyway if next time somebody asks me to give some advise about how to use chess-software then first I will refer to the manual. Finally sometimes I also get the remark that preparing is not possible for the lower rated players as there are insufficient games of the opponents in the databases. An available laptop, a good interface installed with up to date databases and having read the manual won't help for them. Still I know by experience that people often underestimate their possibilities even if only a handful games can be found of the opponent. 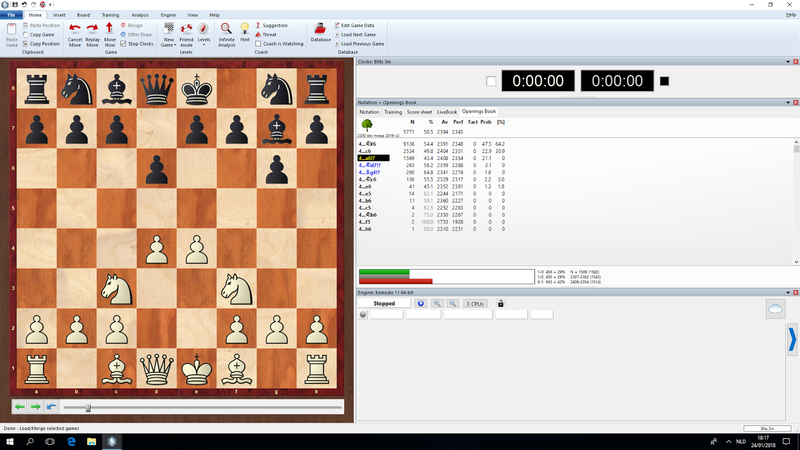 A nice example occurred in the 4th round of the last Open Leuven. 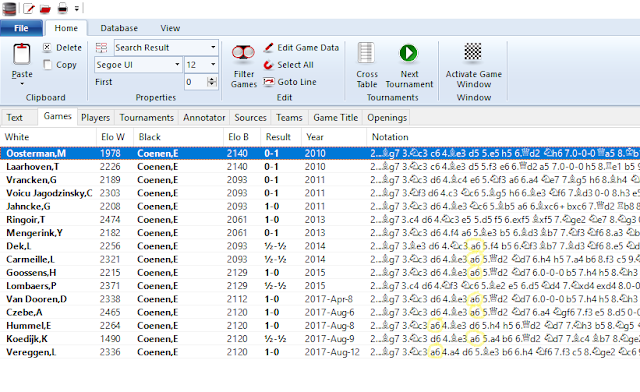 I first filtered the position after white's 4th move and noticed that the Dutch expert Eduard Coenen has no games with that position in the databases. From above screenshot we detect that in the opening-book there are more than 10.000 games played with this position. It seems that the number of possibilities are too big to prepare anything seriously. Still now I address my special number-crunching-skills. 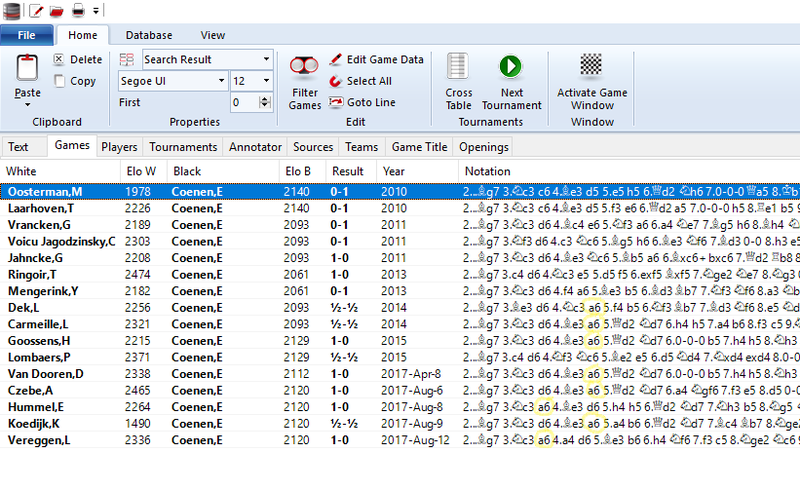 In my daily job I need to find trends in sequences and something similar is possible even upon a handful games. Let us look at some of the most recent games played by Edouard. As explained in my article using databases the hotkeys "ALT+Q" are very useful for that. I note immediately that Edouard prefers to play somewhere a6 in the opening irrespective of how white plays. That can be something consciously but more often it is a sign of a lack of flexibility by the player. People don't like change so will often stick to some habits. I already covered several examples of this phenomenon on my blog see game preparation part 1, bjk part 1, bjk part 2 with as most stunning ones of course my articles to open with the f-pawn and universal systems. So I concluded that it is very likely Edouard will also play a6 in the earlier mentioned position despite there exists no real proof. This information allows us to prepare much more efficiently. It is not much effort to at least look at the mainlines. Besides I already had some experience in that line see the fake truth. We see in below screenshot that the number of mastergames is very quickly diminishing. I will cover the game in a next article but I can now already share that Edouard was totally surprised by my preparation. That is also something which I learned by experience when playing against somebody with very few games in the database. Those players don't expect at all any preparation so the effect is often much bigger than when you play against people with many games in the database. So next time you a play a tournament, consider to bring your computer and who knows maybe you will win an extra point.